Even if you have the best automation framework, without reporting it's difficult to know just what went wrong and where should we fix if it is an automation issue. These reports help us to make important decisions as per the release requirement. Automated reporting provide valuable insights into not only the big picture of the tests executed, also the details of each test case passed and failed with screenshots. Page Object Model is a design pattern which is very popular in test automation for enhancing test maintenance and reducing code duplication. POM is best for the applications which has multiple pages. If your not familiar using page object model, please refer to understand how page object design patterns works. We will be using page object model example from previous article where we already created page objects and tests. 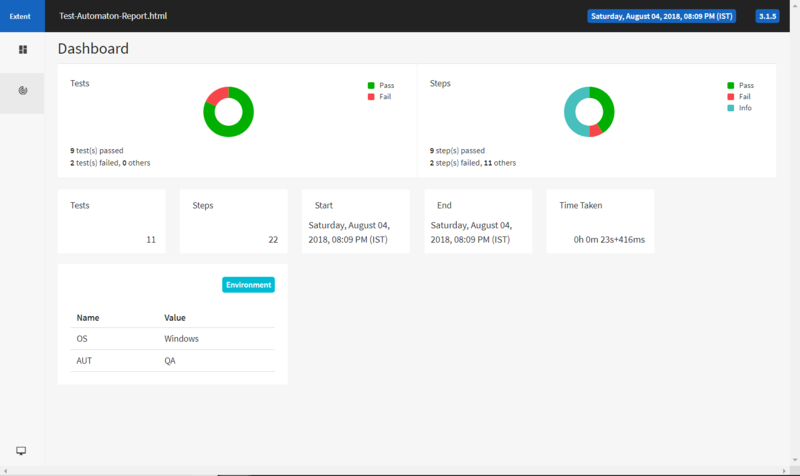 And will add few changes to integrate extent reports using TestNG ITestListeners. Now right click on folder and add new Class file in it and name it to TestBase i.e. 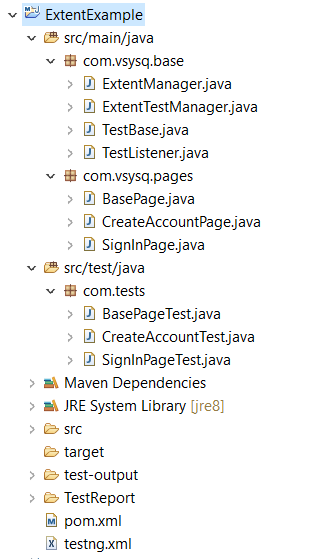 TestBase.java to create a driver, where all our tests and page classes use this driver. Now let us create Page Objects for the required classes one by one. First will create BasePage.java to add locators and methods of this page object class which can be used to interact with the UI of that page. Now let us create TestCase classes in Tests package and name it according to the test. If you observe the above test class, we have used Extent report logs. We can input logs in the HTML report. To log the inputs to the report, we need to use the Status.INFO as first parameter and text to be displayed as second parameter for log() method. Also use Status.PASS / Status.FAIL in the test Methods when needed. In our example, first we need to get ExtentTest instance from ExtentTestManager and then add log method in testng tests. Until here, we have create a POM style framework with few page object classes and test classes. Now let's integrate Extent Report with Selenium WebDriver. if you are new to ExtentReports, please refer previous article which talks about Introduction to ExtentReports with basic example. Let us create a class and name it as 'ExtentManager.java'. In this class we will create and instance for ExtentReports using createInstance() with HTML config params like the report location, Report name, Theme format etc. Now let us create ExtentTestManager class to get ExtentReports instance from ExtentManager class. This can be used to create instance of ExtentTest and put into extentTestMap with current thread id. If you want to this ExtentTest instance in your TestListiner or Selenium webdriver test classes, we can use getTest() method, which returns ExtentTest instance from extentTestMap by using current thread id. Now will create TestListener.java class and implement TestNG ITestListener - A listener for test running. You can check more about TestNG Listeners which we have discussed with multiple examples using TestListiners. OK, let's try to execute tests to make sure everything is working. Now you can run the test by right clicking on testng.xml file or, you can have maven surefire plug-in to execute your tests using maven. Once you run, you should see an instance of chrome browser automatically open up! Google should automatically be loaded in a tab and rest followed. 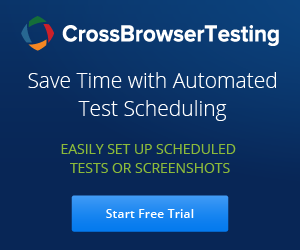 There is also nothing to stop you running the test methods in parallel. Let's try this! Thanks for the guidance very helpful , solve all my problem except one . log variable is undefined so don't which dependency it is using , and if defined as local variable with ExtentTest then OUTPUT getScreenshotAs(OutputType.FILE) of selenium is giving error . And if i remove the log ie comment to run my code then i ma not getting the screenshot in report.